This security poster illustrates the PRB M3 Belgium Anti-Tank mine. This anti-tank mine is a minimum metal mine, and it is fitted with anti-lift fuze wells for booby trapping. This mine is deployed extensively in African countries. 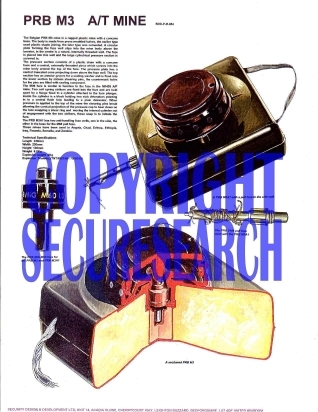 This security poster features the technical specifications of the PRB M3 anti-tank mine, the PRB MiG M60 fuze for the PRB M3 and the PRB M3A1, the PRB 2144 pull fuze used with the PRB M3A1, a sectioned PRB M3, and a PRB M3A1 with a pull fuze in the side well. A PRB M3A1 with a pull fuze in the side well. The PRB 2144 pull fuze used with the PRB M3A1. The PRB MiG M60 fuze for the PRB M3 and the PRB M3A1. The technical specifications of the PRB M3 Anti-Tank Mine. If you have any questions about our security poster products, please call us toll free at 1-800-452-3130 or e-mail sales@securesearchinc.com or use our contact form. You may also download an order form, fill it out and fax it to us or scan and email it to us. Select this link to download an order form. All Security Posters Are In Stock And Include No Charge Shipping In North America. Pricing includes applicable sales taxes for US Orders. Canadian customers have appropriate sales taxes added to your order. If ordering from outside North America you can place your order a number of ways. You may use our on-line store, download an order form, fill it out, scan it and e-mail it to us at sales@securesearchinc.com or phone our Canadian office at 1-416-492-5349, or use our contact form to have us contact you. Orders from outside North America are shipped via most economical means and shipping charges billed.